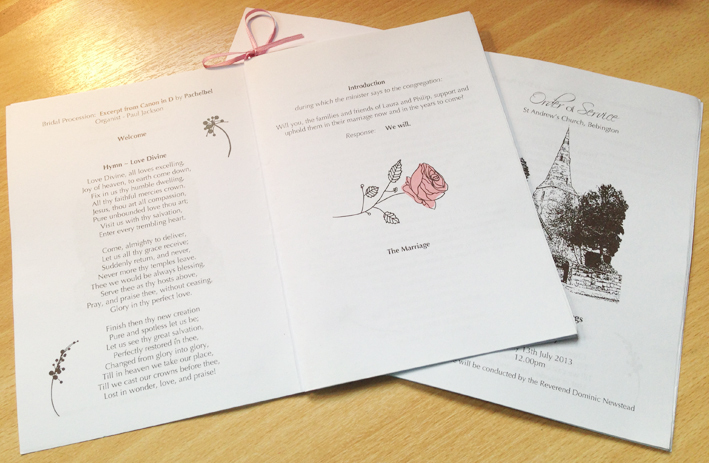 Commissioned by Mother-of-the-Groom Gill Brady, I was delighted to be asked to design wedding stationery including the Order of Service shown below for Phil and Laura's wedding, being held at the same beautiful church where I got married many years ago! The colour scheme for the flowers was ivory and dusky pink, so I took this as my inspiration and designed a stylish layout for the Order of Service documents which would blend well. I also designed matching music covers for Gill's choral group Mes Amies, who sang at the service. 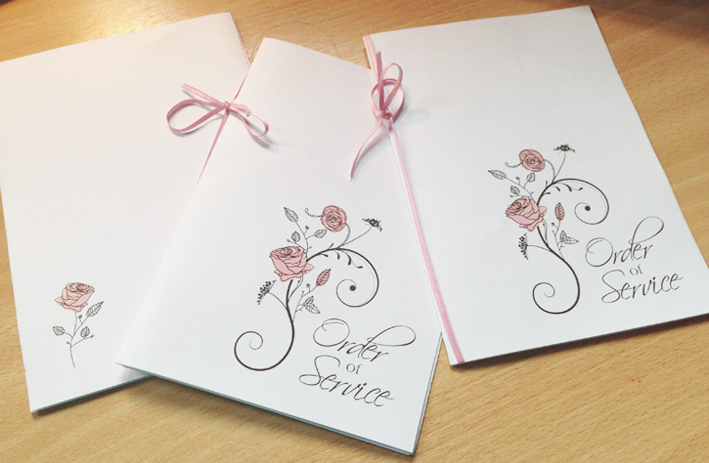 Gill arranged for the documents to be printed locally, then bound them using matching pink ribbon to create this stunning effect. "We are all very pleased with the result - thank you so much for a speedy and professional job - as always!" 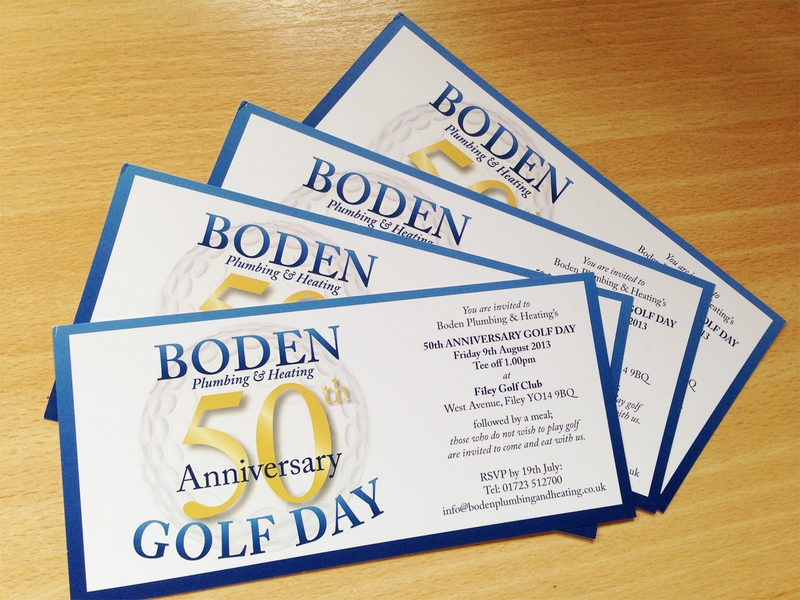 Following on from designing their new business cards and corporate stationery, Boden Plumbing & Heating in Scarborough asked me to produce an invitation design for a very special event - their 50th Anniversary Corporate Golf Day. Using their existing branding, I designed DL sized invitations, perfect for mailing, and arranged print delivery to meet their tight deadlines. "Thank you, Gaynor - the invitations are great, everyone will love them!" I have been working with the fabulous people at Buzz for nearly 6 years now, designing their new logo, and leaflets, posters, business cards, stationery, display banners and flyers to promote their wonderful Play Centre, their Ofsted-rated 'Outstanding' Out-of-School Club, and innovative (and frankly genius) Wedding Creche service. 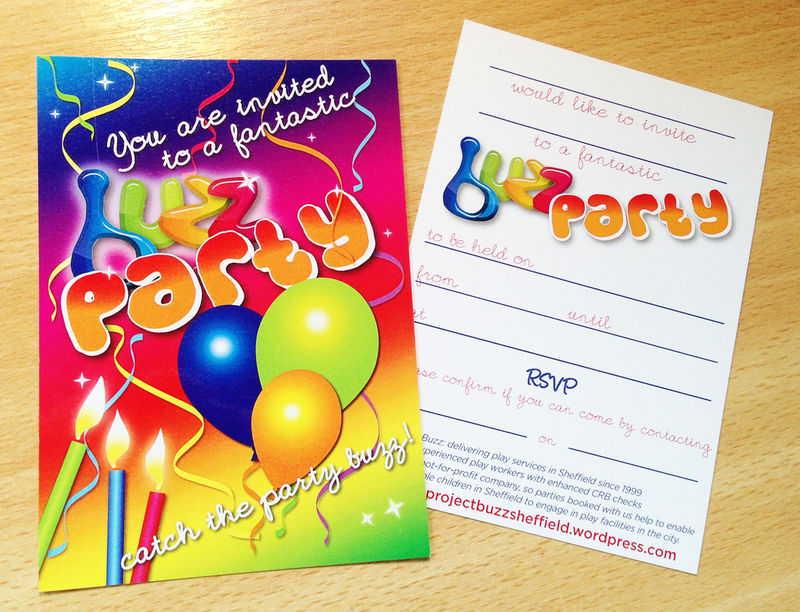 Now, my challenge was to design pre-printed invitations for their brilliant Buzz Parties scheme. Manager Kath Mardles asked me to come up with a design which they could use to give out to parents arranging their child's party with Buzz to invite guests, so picking up the vibrant colour scheme and styling we'd used on their other material, I designed a fun and exciting (and unisex!) image which we had printed as gloss fronted postcards (making the colours really 'pop'), with spaces on the back for the party girl or boy to fill in their details. "WOW! - we love it - it's fab!!"